It was a night of good NHL action last night with a lot of tight games. that Knights vs Sharks one was a real interesting one and it shows what a workhorse the Vegas Knights are. I’d looked closely at that one yesterday. I was extremely temped by both the Knights win and the Over. What put me off however was the Sharks. Win or lose, they seem to dictate the games and have low scoring games. Actually only THREE of their games all season have been over 5.5 goals. That’s crazy. That was enough to put me off tipping that one – yet the Knights not only won, but forced a rare high scoring game out of the Sharks. Absolutely crazy how hard the Knights work and what they’re doing this season. Very impressive. Man the Leafs did not deserve to win last night. They are not looking good at the moment – crazy to see them regress so fast. That 1st period especially – it was as if none of them had ever played hockey before. Going to be an interesting next few games for the Leafs. An interesting day today. At first glance not a lot stood out but as I dug deeper into it, there was a fair bit we both liked. – Scott likes the Hawks over the Panthers. They’re the underdogs but he likes their record against the Panthers in the last 10 and feels they’ll be out for revenge after their last meeting. – Scott likes the Leafs/Caps over especially with Andersen not starting. 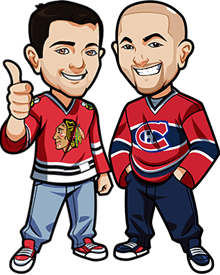 – Graeme feels the Devils/Wings is a tight game and a bet on it going to OT has value. – Graeme feels the Sharks have a good chance to beat the surging Jets as they’ve shown this season they’re a solid bounce back team. The odds just aren’t enough though based on the performances of the Jets lately. Carey Price is back in net for the Habs tonight. Look I know more than most how bad the Habs are at the moment. Even when Price was in net it didn’t matter. Price is like putting a bandaid on after taking a shotgun to the head at this point. However Price back should just be enough to give them that confidence to turn this losing streak on its head at the Bell Centre tonight. Hell last time they won was aginst the Sabres. I think the only concern here is if the Sabres get an early goal – that could really spook the Habs. But I just have to think that Price will give the Habs that confidence they need tonight and it’ll temporarily erase all of the issues they have had this season. Canada: 1.83 Odds at Sports Interaction + $20 Free Money Line Bet. Everyone Else: 1.83 Odds at 888 Sports. Knights have proven that they can perform on the road. They’re going against a Coyotes team who you have to think they won’t take lightly after their performances lately. I’ll tell you – I’m not 100% convinced. My main concern is the Knights performances on the 2nd leg of a back to back. However Subban is scheduled in net and with his performances thus far, the confidence the Knights have shown with him between the pipes and really just the Knights performances overall – I’ll stick with them. But as a warning – it’s one where we’ve made the pick but I’m starting to not like it as much the more I look at it. Tampa offense has been a little bit disappointing the last 2 games but they were still two tough games. Penguins offense has scored 5 in the last 2. Penguins are a messy team at the moment but they still have that quality. It seems to be undecided as to who is in net, so we’re going goalie dependent here. If Vasilevskiy and Jarry are in net, we like Lightning to win. If Budaj and Jarry are in net, we like the Over 5.5 Goals. Over 5.5 is 1.91 at Pinnacle Sports. Tampa win is 2.00 at Bet365. It’s an Islanders game and I’m going with Over 5.5 Goals – no surprise there. I just love their offense this season and they can’t seem to get it going defensively. Senators are struggling defensively this season but their offense can get going especially in similar matchups to the Islanders. Should be a high scoring game. Everyone Else: 1.80 Odds at Bet365. OHL Betting Tips (13-5, +6.66u): Saginaw Spirit inco OT/SO 1.86 odds. Sault Ste Marie Greyounds 1.85 in regulation. WHL Betting Tips (8-9, -1.89u): Moose Jaw Warriors & Portland double at 2.17 odds. Kamloops incl OT/SO at 1.88. Spokane Chiefs incl OT/SO at 1.74 odds. AHL Betting Tips (7-8, -1.15u): Bridgeport Sound Tigers incl OT/SO at 2.23 odds. KHL Betting Tips (16-11, +3.63u): Risky one but double of Jokerit & CSKA both -1.5 at 2.29 odds.